Prince George's First Official Photos Break With Tradition : The Two-Way The casual snapshots, taken by the Duchess of Cambridge's father, are a departure from the professional "first photos" taken in the past. They're another sign of the way the young royals are departing from some ways of the past. Prince George and his parents, in the baby's first "official" photo (taken by his grandfather). "Prince William and the Duchess of Cambridge have bypassed professional photographers and chosen family snapshots for the first official images of their new son, Prince George," as The Associated Press writes. "Royal officials on Tuesday released photos of Kate holding the swaddled baby while standing beside William — and in one image, the couple's cocker spaniel, Lupo, [and retriever, Tilly]. The pictures were taken by Kate's father, Michael Middleton, in the family's backyard. The casual images are a departure from the royal tradition of hiring professional photographers for baby portraits." According to Reuters, "some royal watchers were disappointed that the first photos released of Prince George failed to show his face and were not of a professional quality. But the decision to eschew tradition for a more informal approach was seen as true to form for William and Kate, both 31, who have tried to break away from royal traditions of rigid formality, be it by changing diapers themselves or William driving his family away from the hospital." But the BBC adds that "renowned photographer Terry O'Neill said he thought the pictures were 'absolutely charming.' "
The prince — George Alexander Louis, His Royal Highness Prince George of Cambridge — was born July 22. He's third in line to the crown. In a second "first" photo of Prince George, the family's dogs joined in. 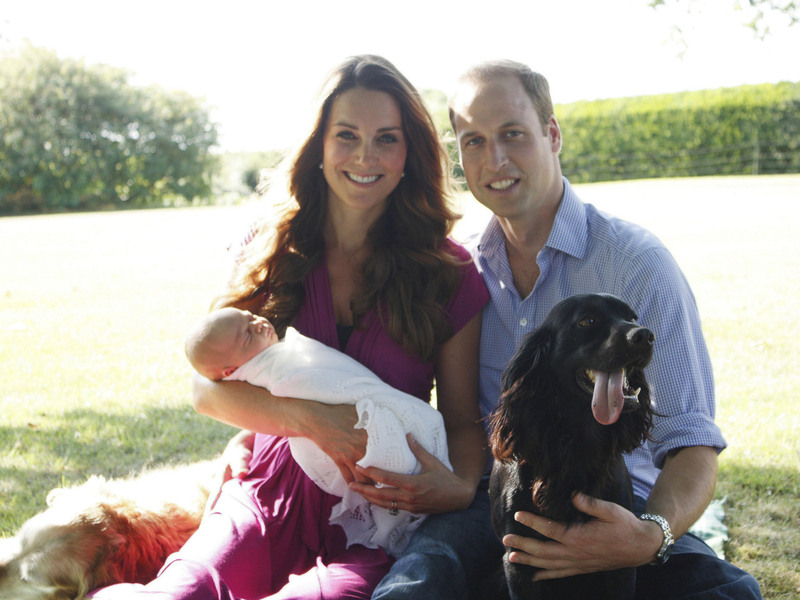 Tilly, a retriever, is to the Duchess of Cambridge's right. Lupo, a cocker spaniel, is beside the duke.